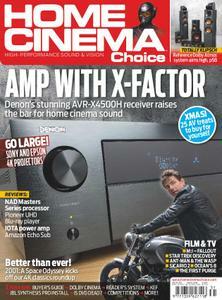 Class-leading connectivity, fulsome features and superior surround sound performance – Denon’s AVR-X4500H is our cover star this month, and our in-depth review finds the AV brand reinventing the home cinema AVR for the 21st century… Also on the test bench this issue is Pioneer’s UDP-LX800. Offering audiophile functionality and an astonishing build quality, is this the best disc-spinner you can buy? We also run the rule over a Klipsch Reference 5.1.2 Dolby Atmos speaker system; NAD’s upgraded M17 Masters Series processor; 4K projectors from Sony and Epson; Amazon’s wireless Echo Sub; a seven-channel power amplifier from IOTA and more. Whatever your budget, we’ve got you covered. On the software side, we check out new Blu-ray and 4K releases including Mission: Impossible – Fallout, Ant-Man and the Wasp and Sicario 2: Soldado. We also spin up a wave of classic movies reborn on Ultra HD, including 2001: A Space Odyssey and Superman: The Movie. Elsewhere, we report on a pair of stunning professional home cinema installs with state-of-the-art AV; run through a wish-list of Christmas gifts to boost your system; take a tour of a reader’s garage conversion home cinema room; and wonder if the final nail has been hammered in the DVD coffin… Plus: all the usual opinion, news, disc reviews and competitions at Home Cinema Choice magazine. Enjoy the show!